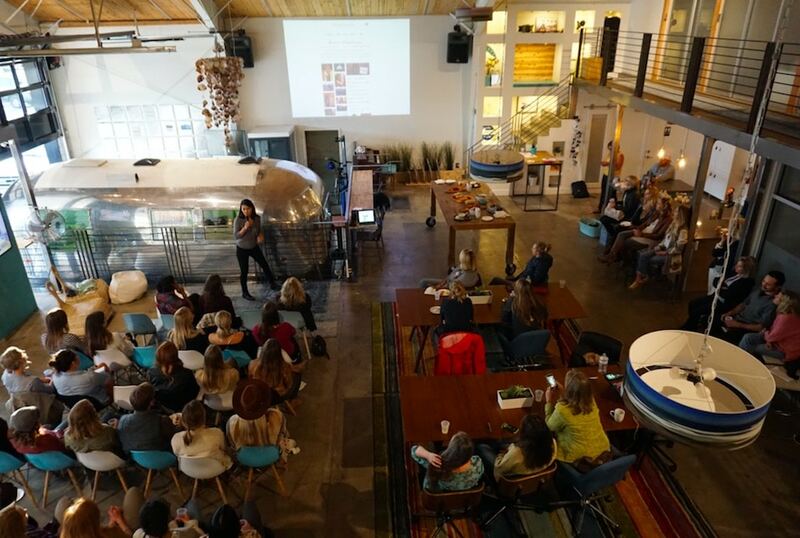 In January 2018, the Art, Design & Architecture Museum, UC Santa Barbara (AD&A Museum, UCSB) partnered with impactmania and launched a unique collaboration. To cement this partnership, Paksy Plackis-Cheng, impactmania’s founder, was named Senior Fellow of Research and Media. The AD&A Museum is partnering with online platform, impactmania, to develop a unique and ongoing collaborative series of exhibitions, events, and student internships related to some of the most pressing issues of our times. The inaugural topic and exhibition Women of Impact highlights impactmania’s focus on women’s contributions to society. 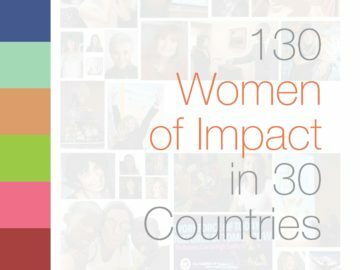 Although most media would like us to believe that women have taken a backseat in driving cultural, social, and economic impact, impactmania has featured more than 130 female change-makers in 30 countries, including artists, ambassadors, impact investors, social entrepreneurs, scientists, and a Nobel Peace Prize nominee. Considering the current empowering spirit and the enduring equality issues raised by women, this theme is perfectly timed. The exhibition at the AD&A Museum underscores some of the featured women’s contributions through audio/visual installations. Additionally, there will be opportunities for the public to add their own voice. 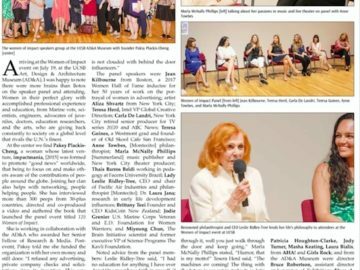 This exhibition is complemented by a panel discussion on July 19th that includes women featured in the book from across the country, among them: Jean Kilbourne, Women Hall of Fame inductee 2017; Teresa Herd, Intel’s vice president Global Creative Direction; Laura Jana, M.D., award-winning author; Aliza Shvartz; artist and scholar; Jodie Grenier, former U.S. Marine Corp. and executive director, Foundation for Women Warriors; Teresa Goines, executive director, Old Skool Café; and others. This exhibition has been created by the founder of impactmania, Paksy Plackis-Cheng, with AD&A Museum interns: Zoe Crouzat, Haoran “Tyler” Jiang, Nicollette Juchum, Madeleine Lazarovits, Marirose Meyer, and Winston Braun. The AD&A Museum and impactmania partnership will focus on researching and investigating the changing landscape of education. While information becomes ubiquitous and pervasive (i.e. artificial brains: machines that will be as smart as/smarter than human beings), what knowledge and skills must humans have? How do we assess the quality of automated information and decisions in terms of its accuracy and agenda? What role does exposure to the humanities and arts play in the future? How do we educate the next generation of impactmakers? 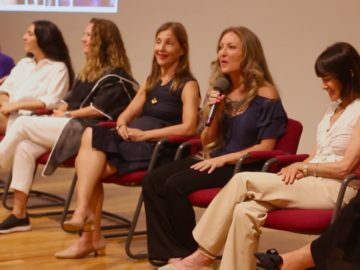 This project will incorporate interdisciplinary collaborations across the UC Santa Barbara campus, as well as with thought leaders from around the world. More than a dozen UC Santa Barbara professors, representing multiple departments, have agreed to participate, from Bio-Engineering, Chemistry, Global Studies, Materials Research Lab, Religious Studies, Sociology, and others. We seek participation from the Division of Humanities and Arts, Economics, and Neuroscience. An exhibition on The Future of Education will be shown using dance, music, and/or theater, including a digital module that can travel to other educational institutions. Twelve students, from departments throughout the university, will be awarded internships with a stipend. Additional funds will be needed to cover research, travel, and related costs associated with conducting and producing interviews in the field. As societies become wealthier around the globe and yet more people are struggling for survival and basic welfare, how do we build an inclusive economy that provides opportunity for everyone to realize their potential and impact? How do we transition to an ecosystem that supports a more sustainable economy? 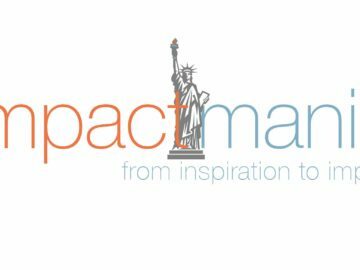 impactmania has interviewed hundreds of social enterprises globally, with the first of its social enterprise video stories featured at the United Nations Global Compact Conference in 2017. In partnership with the AD&A Museum, UC Santa Barbara faculty, and students, we aim to tackle some of the issues raised by this topic in an exhibition, most notably by working with artists. How do we connect the poorest of the poor with the richest of the rich for mutual benefit? How do we develop an ecosystem with sustainable economic models that are good for people, investors, and the planet? How do we enable social entrepreneurs to deliver lasting social impact? How do we transition to a new world financial model? We will continue to enhance our internship and fellowship programs to ensure that the AD&A Museum will be a global center that visualizes thought leadership and delivers cultural, social, and economic impact. Our goal is to recruit 24 students, from all UC campuses, for internships. Stipends will be offered to defray expenses, cover research, travel, and related costs associated with conducting and producing interviews with those in the field who are wrestling with these topics. We hope they will build a life-long network with other AD&A Museum interns. The future of security: policing; cyber security; nationalism; ethics and technology; role of context and judgment; framework for successful mentorship; and how do humans maintain agency with the rise of technology. Photo: Paksy speaking at SheVentures about this year’s project, Women of Impact, in collaboration with AD&A Museum. Photo: SheVentures. Location: Sandbox Santa Barbara, CA.